Enjoy the flavour of freshly-picked peas and beans growing on your doorstep! 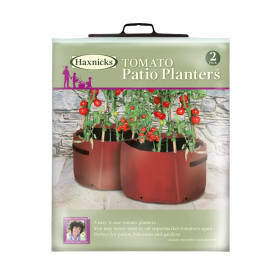 The Haxnicks Pea & Bean Patio Planter is designed specifically for use on patios and balconies, or in small gardens. 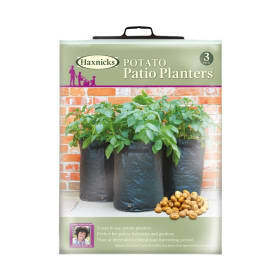 These Pea and Bean planters have drainage holes and the sides are reinforced with rigid tubes. 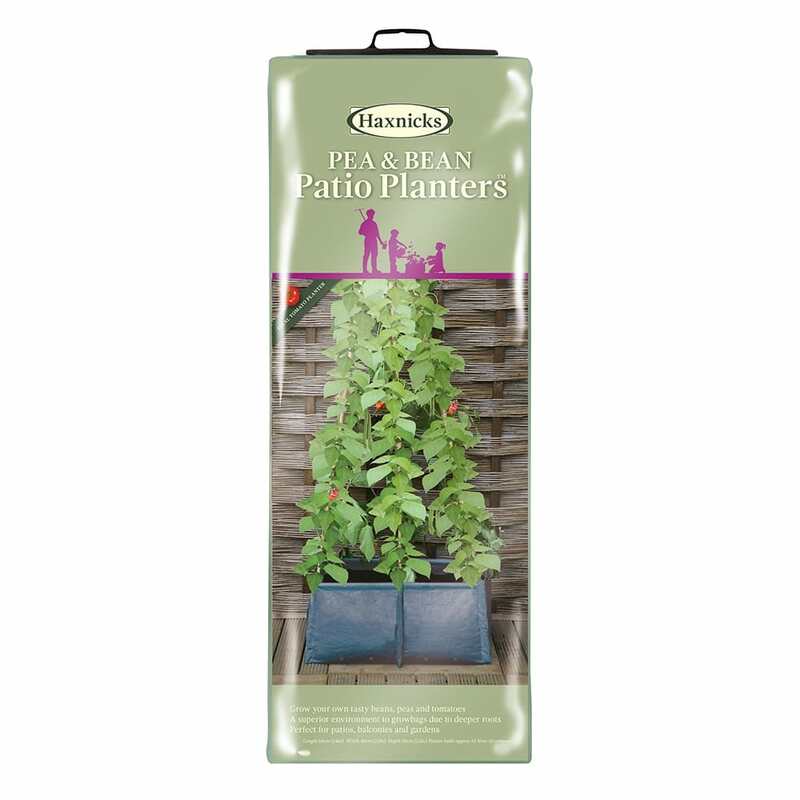 There are 6 cane pockets to hold your supports firmly in place without disturbing the soil. They fold flat for easy storage,are reusable, and come with a helpful growing guide. Helpful Haxnicks hint: even if you have a big garden, they are very handy to have just outside your back door. 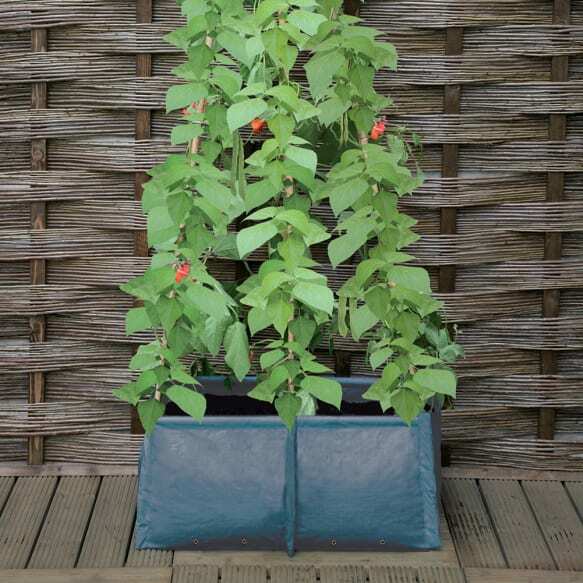 Enjoy the satisfaction of picking your own tasty crops straight from your Patio Planter, especially designed to hold 6 canes for climbing vegetables, fruits, or flowers such as sweet peas; a great idea for growing cut flowers for your home. Why not buy 2 or more & start your own instant allotment! You can grow almost anything in a Patio Planter – choose the varieties that you like, or use our suggestions below. 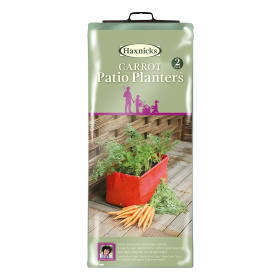 Most Garden Centres and catalogues sell young vegetable plants, or you can keep costs to a minimum and start your own tasty vegetables from seed, sown directly into the compost, or indoors in pots on your windowsill. You can use your Patio Planter™ to grow all types of Peas & Beans. Here are just a few examples of our favourites. Pea Meteor - Very good winter hardiness, ideal for an autumn sowing. Pea Hurst Greenshaft - a reliable disease resistant, second early variety. Pea Oregon Sugar Pod – A superb ‘Mangetout’ variety cooked whole. Pea Sugar Snap - a round podded ‘ Mangetout’ variety cooked whole. Runner Bean Red Rum - A very early cropper & very reliable. Runner Bean White Lady - A white flower variety less prone to being picked by birds. 1. Approximately 55 litres of high quality multi-purpose compost. Compost specifically formulated for containers will help keep the compost moist. 4. Suitable liquid or soluble feed for vegetables. 1. Place a layer of gravel, or other suitable material into the bottom of the planter to help drainage. 2. Fill with good quality multi-purpose compost to approximately 4cm (1½ins) height from the top of the planter. 3. Follow instructions on seed packets if sowing direct, remembering to thin out seedlings when large enough to handle. 4. Water plants before planting, & allow to drain. 6. Place canes in the pockets around your planter, & train plants upwards & around the canes as they grow.